Richards-Wilbert offers burial vaults and cremation urn products to counties in Maryland, Pennsylvania, Virginia, and West Virginia. 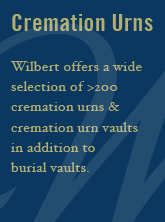 Richards-Wilbert offers burial vaults and cremation urn products to Washington County in Maryland. Richards-Wilbert offers burial vaults and cremation urn products to Franklin and Fulton counties in Pennsylvania. Richards-Wilbert offers burial vaults and cremation urn products to the following counties in Virginia: Alleghany, Amherst, Augusta, Bath, Bedford, Botetourt, Campbell, Carroll, Clarke, Craig, Floyd, Franklin, Frederick, Greene, Giles, Grayson, Highland, Madison, Montgomery, Nelson, Page, Pulaski, Roanoke, Rockbridge, Rockingham, Shenandoah, and Warren. Richards-Wilbert offers burial vaults and cremation urn products to the following counties in West Virginia: Berkeley, Grant, Greenbriar, Hampshire, Hardy, Jefferson, Monroe, Morgan, Pendleton, and Pocahontas.